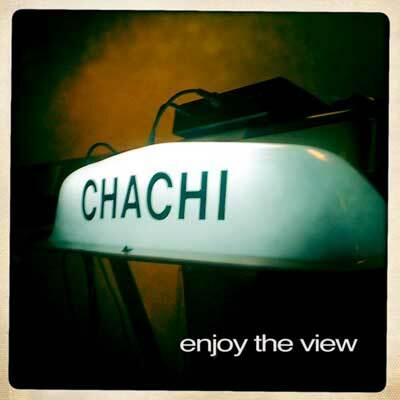 Album 2.0: Enjoy the View | Chachi - The indiest band in the land: music, videos, concerts, photos, etc. « Chachi Album Release Party! Recording took place in two locations. Full drum set tracks were done at our rehearsal studio in Santa Fe Springs, everything else was done in my living room. Performances were captured by a Presonus FireStudio Project, plugged into a Macbook Pro running Logic Pro 9. I used Orange County Speaker’s GLS ES57 and ES58 mics (local equivalents to the famous SM57 and SM58). Most of my lyrics and song ideas were written in Evernote, which kept everything in sync between devices. Mixing and mastering was done on a big ol’ 27″ iMac (for obvious reasons) and monitored via KRK Rokit 5 speakers. Online distribution was handled by TuneCore. Our CDs were duplicated by Disc Makers. Thinking about releasing your own record? Then do it! Anyone can nowadays. In the meantime, pick up our new record, available NOW on iTunes!